nb t3wy neb tawy, Lord of the Two Lands. We’ve had nb, Lord, before. Some of the paint has flaked off, but it’s still quite recognisable as the basket hieroglyph from Osiris’ titulary. Each of the thick black lines underneath it reads t3, ta, meaning land. Taken together, they read t3wy, tawy, the two lands, as ancient Egyptian had a dual as well as a singular and plural. Sticking a -wy is the way they expressed a pair of somethings. Sometimes the -wy ending would be written out in full, but the two lands, or I should say, the Two Lands, was such a common phrase that there was no need. Everyone knew how to say it. 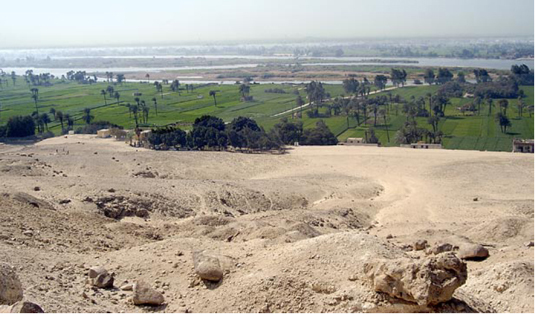 The Lord of the Two Lands usually meant the King in ancient Egypt. Atum has the title because he was the first divine King, and the not-quite-so-divine dynasties who followed the reign of the gods on earth inherited the title from him and his descendants. The Two Lands in question were Upper and Lower Egypt. Way back in the mists of time, right at the beginning of Office Hieroglyphs, in fact, we heard how the tribes along the Nile in Predynastic times gradually became two kingdoms, one based in the Nile Valley and one in the Delta, until, eventually the two became united under one King. After unification, Kings were careful to proclaim themselves the rulers of both kingdoms. You can see how dependent the whole of Egypt was (and still is) on that flat black soil with the sandy borders, and how the Delta and Nile Valley kingdoms would have kept their distinct characters even after unification. Right from the beginning, when he made the first mound of earth rise from the water, you could say that Atum was in two minds about his new venture.